Sometimes there's just nothing better than a slightly cheesy rom-com style meet cute! And this anthology gives you 14 of them! What more could you want? In all seriousness, once I got over the fact that I wasn't going to see the whole relationship develop (duh, it's a MEET cute), I thought this was one of the better anthologies I've read. They were all quite good - I know sometimes it can be a mixed bag - but I don't think there were any that I really didn't like. This is my very first review of 2018 and what better way to ring it in than an anthology of love stories? Today, my review is of Meet Cute, an anthology by various authors. Thanks so much to Raincoast Books for sending me an ARC of this book for an honest review, as always, all opinions are my own. Like with other anthologies, I'm going to talk about my thoughts on each story separately. This was the first story in the anthology and set the pace for the rest of the collection. It was told in second-person, which initially jarred me a little bit once I got used to the writing style, I really liked it. After the cops show up at a party, the love interests find themselves stuck in hiding in the bathroom together. I enjoyed this one and wanted to see where things would go from there. 4.5/5 stars. Also told in second-person, this story is about a f/f meet cute and I loved it! The main character has just started her job at an old-fashioned print shop and the love interest turns out to be an upset customer. I've read a couple of LaCour's books in the past, and this story reminded me I needed to pick up more in the future! 5/5 stars. This was a great diverse meet cute story, the love interests are both people of colour and also looks at body diversity and socio-economic issues. I've never read anything by Zoboi, but I loved how she wove this story into something totally unexpected. This was one of those fated meet cutes, where your best friend has to get back together with the jerk who made your life miserable in order to happen. 3.5/5 stars. Set in 2020, this was a super cute story about two people that meet on an app called Click. It combs through your online presence and calculates the compatibility with other users. The concept was pretty intriguing and I love getting to know the characters in the dual narration. This was another one of those stories where I would have loved to see their full story. 4.5/5 stars. What collection of love stories would be complete without the famous musician falling for the intern tasked with showing him the city? That's exactly what this story was about. There were, of course, larger themes and issues, but that's basically the bare bones. This one was a little cheesy and predictable but still good. 3.5/5 stars. I was really excited to read a story about a transgender girl, especially from the author of If I Was Your Girl. This story focused not only on LGBT themes but also current social issues (i.e. the bathroom issue) and religious commentary. I thought the story was well done, but I found the dual narration a bit choppy at times. 3.5/5 stars. Up to this point, the stories in the anthology have been contemporary. This story brings in some magical realism elements with a girl living on an island where it's people are born with coils on their ring finger that fade as time passes until they meet their soul mate. It was a really intriging concept but I think it could have been better fleshed out in a full-length novel as opposed to a short story. 4/5 stars. I'm a sucker for airport romances and Lord played with that trope beautifully here. This was another f/f romance and I loved every second of it! Lord has recently become one of my go-to authors, so I wasn't too surprised, but she wove a classic meet cute story where the characters meet, and may never see each other again. I would love to read more about these characters in a full novel! 5/5 stars. Another fave author of mine, I knew I was going to enjoy this story. The main character works at a library and is on a mission to get the borrower of a dictionary to return the long-overdue book. She chats with him on the phone when she calls to remind him to bring it in, and while they don't know who the other person is, their relationship grows. This was a sweet, fun story that wasn't too heavy, and I really enjoyed it. 4/5 stars. This may have been one of my favourite stories in the whole anthology! The main character is the only girl in her AP Statistics class and after seeing a boy on the opposite subway train, she decides her final project will be about the likelihood of them meeting again and finding love at first sight. The story is set up like a lab report with an intro, hypothesis, research, analysis, and conclusion and it worked really well with the storyline. 5/5 stars. This was another sci-fi lite story where the love interests are interviewing for a one way trip to Mars. I enjoyed the meet cute part and the characters, but I wasn't big on the whole going to Mars thing. I felt the ending was a little over-dramatic and maybe unrealistic, but overall it was a good story. 3/5 stars. While I haven't read Dumplin', I had heard many good things about it and was excited to read something from Murphy. I thought this was going to be another one of those celebrity crush stories but Murphy really surprised me with the twist at the end. I think I ended up liking this story, but not loving it as much as some of the others. 3.5/5 stars. Another author I have read many books by, I knew I was going to enjoy this story. It was also told in second-person, but it wasn't too hard to get into. I think I would have liked this one a bit more if there was more background information, perhaps in a full-length novel, but it was still pretty good. 3.5/5 stars. I wasn't quite expecting this kind of story from Yoon, it's unlike her others because it seems to be a scientifically advanced future where dead love is autopsied and explained. I thought it was a good story, albeit a little bit strange at times. It ended pretty much how I thought it would but I was okay with that. 3.5/5 stars. 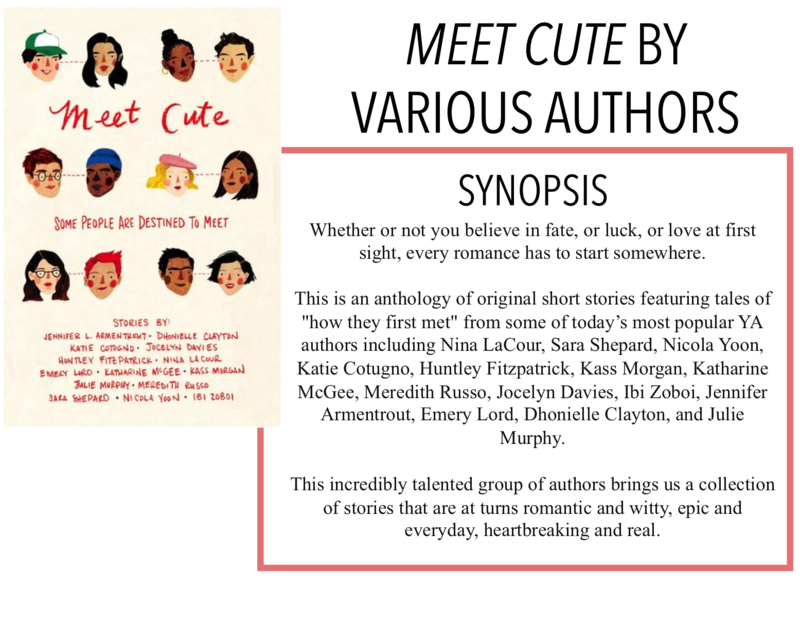 Overall, this was a really well done, diverse anthology that covered different genres and types of meet cutes.